Gamma-Rays are photons, or light particles, just like the light that emanating form your computer screen. However, unlike visible light, gamma rays have extremely high energies -- physicists define gamma rays to be the highest energy light that exists. 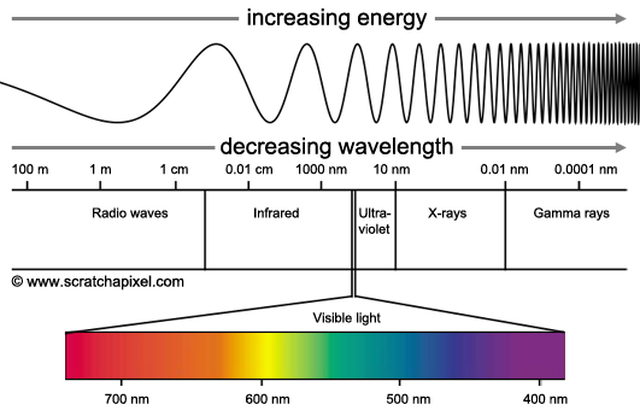 While the light humans can see has an energy of approximately 1 eV, which is a unit of energy used commonly in physics. By comparison, gamma rays have energies of more than 1,000,000 eV. Gamma-Rays have been observed with energies exceeding 100 Trillion (10,000,000,000,000) eV, and we know that even higher energy gamma rays exist. The Explorer 11 spacecraft, launched in 1961, found the first evidence for gamma-rays coming from outside of the Earth's atmosphere. Over the course of 141 hours of recorded observing time, it captures 31 gamma-rays coming from space. Astrophysicists had long realized that many of the most energetic events in our galaxy, such as those occuring during supernovae, should produce gamma-rays through their particle interactions. Since strong electric and magnetic fields are required to accelerate particles to such high energies, gamma-rays would serve as a very specific probe of the most energetic sources in our universe. For example, in visible light, the Sun is by far the most luminous object in the sky, providing light millions of times brighter than every other source in the sky combined. However, the Sun is relatively dim in gamma-rays because the magnetic fields of the Sun are too weak to accelerate particles to such high energies. The brightest point source of Gamma-Rays in the sky is the Crab Pulsar, the energetic remnant of a supernova explosion that occured (and was observed by astronomers on Earth) in 1054 AD. A second spacecraft, launched in 1967 was named OSO-3. It detected 621 gamma rays, enough to make the first map of the gamma-ray sky. This image shows the first observed structure in the gamma-ray sky, an excess in gamma-rays stretching across the plane of the Milky Way. This shows that the brightest source of gamma-rays we see stems from inside our own Galaxy (note: This is only true because our galaxy is so close to us -- there are millions of galaxies with very similar gamma-ray emission to our Milky Way). The first image of gamma-rays observed by OSO-3. Compare the quality of this image to the later images by the Fermi-LAT! There are two reasons that gamma-ray observations are tricky. The first is that there aren't many gamma-rays out there. For visible light, the sun hits every square meter of the Earth with about one billion trillion photons per second. By comparison, for energies above 1 billion eV, the Crab nebula emits only 340 photons in every square meter per year! That means we need big instruments viewing the sky all the time, in order to observe these extremely unique particles. The second reason that gamma-ray observations are tricky is due to the high energy of gamma rays. For visible light, we use charged-coupled detectors, like those in your cell phone camera. When a photon hits a piece of silicon inside the detector, it very neatly moves an electron along the circuit. This signal is then amplifiedso the data can be read out. However, gamma rays go through most material -- like how X-Rays go through your bones, but on steroids. To observe a gamma ray, we need provide a lot of material for the gamma ray to interact with. Current instruments are thousands of pounds, and the gamma ray might interact anywhere inside the instrument, or even pass through it entirely. But when these gamma rays do interact, look out! A gamma ray hitting a piece of silicon doesn't just accelerate one electron, it provides enough energy to spontaneously produce a new pair of an electron and positron. These particles both move through the detector at such high energies that that they will crash into everything surrounding it, knocking off more electrons, which themselves accelerate more electrons. Sophisticated computer programs are used to understand this "shower" of particles that moves through the gamma-ray telescope, to determine where the first gamma ray came from, and what its energy was. 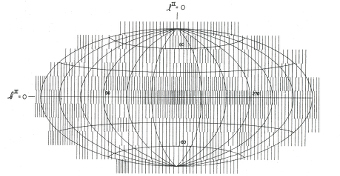 A depiction of a gamma ray interacting inside the Fermi-LAT detector. A single gamma ray begins to travel through the instrument, until it interacts with the instrument inside a dense layer of Tungsten (which is used due to its high electron density, a detail I missed during my Thesis Defense). The interaction produces an electron and a positron, which then propagate through the detector producing a bright electromagnetic shower. By recording the energy and distribution of particles in this shower, the original energy and direction of the incoming gamma ray can be calculated. In June 2008, The Fermi Large Area Telescoep (Fermi-LAT) was launched by NASA, under a partnership of five countries (United States, France, Italy, Japan, Sweden). This instrument orbits approximately 300 miles (500 km) above the Earth's surface, constantly observing nearly 1/6 of the sky in gamma rays. 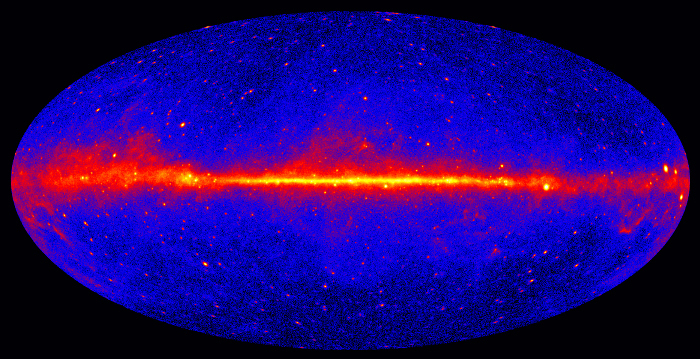 Compared to the 31 gamma rays observed by Explorer 11, the Fermi-LAT has observed over a billion gamma rays thus far, producing a beautiful skymap of the gamma ray sky. The Galactic plane can now be easily seen, along with over 3,000 different point sources (corresponding to black holes in other galaxies, high energy pulsars in the Milky Way, the relics of recent supernovae, and a number of other exciting, intense astrophysical events.) Some previously unknown events were also discovered, such as pulsars that produce no emission in any energy except for gamma-rays, and bright "bubbles" of gamma-ray emission expanding out of the center of our galaxy. In addition to observations in space by the Fermi-LAT, we have also used observations on Earth in order to search for even higher energy gamma rays, those with an energy exceeding 100 billion eV. These gamma rays have enough energy to move through a lot of material, so what about using the Earth's atmosphere to detect the gamma rays? Since these photons are so energetic, when they produce an electron/positron shower, that shower continues to penetrate through the Earth's atmosphere until it reaches the ground. This allows us to build very large instruments that can detect these showers. By observing the shower in multiple places (with many different telescopes) we can reconstruct the initial direction of the shower, and use it to determine where the gamma-ray came from. 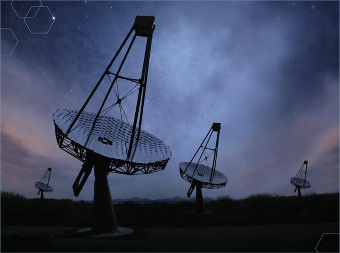 The VERITAS detector, located in Mount Hopkins, Arizona, contains four large optical instruments, designed to observe the showers of the highest energy gamma rays that interact with our atmosphere. In the last 50 years, we've come a long way in gamma ray astronomy, from proving that gamma rays exist in space at all, to recording billions of events and using them to enhance our understanding of the universe. We can only hope that the next 50 years are every bit as exciting!